A new. detached chalet. 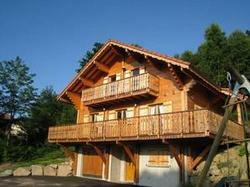 very comfortable and ideally situated right in heart of Hautes-Vosges with a panoramic view over the Meurthe Valley. There are a number of walks close by as well as many sporting activities with the lakes in summer. where you can practise a variety of water sports. and the ski resorts in winter like La Bresse which is 20 km away or Gérardmer which is 15 km away. A security deposit of EUR 500 is required on arrival for incidentals. This deposit is fully refundable max 14 days later and subject to a damage inspection of the accommodation. Price for electricity: EUR 0.25/kWh. Price for water: Mandatory EUR 4.50/m3. Price for wood: Possibility: EUR 80/m3. Please note that the full amount of the reservation is due before arrival. Belvilla will send a confirmation with detailed payment information. After full payment is taken, the property's details, including the address and where to collect keys, will be emailed to you. Energy costs are not included in the price and will be charged according to guest use, upon departure. This chalet features a microwave, fireplace and satellite TV.